Good: Interesting puzzle gameplay, Many things to collect. Bad: No story mode, Not that much content. Stacker games might be a bit underrepresented the last few years, it even has been decades since we saw a game like this pop up (excluding mobile versions). 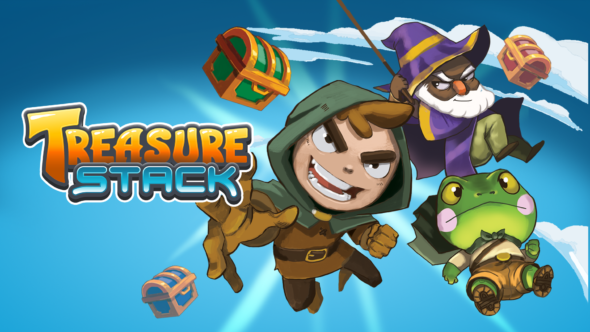 Here comes Treasure Stack, a game that takes the stacker game-type and makes it a multiplayer experience. With a wink to the old-school times, Treasure Stack will take you back to the simpler days with classic gameplay. It all begins in a medieval setting, there is a character select screen and players will think that this is the start of an amazing story mode, but there isn’t one. While all the building blocks are in place and there is a setting that could bring forward an amazing storyline about the life as a peasant (since characters look like poor people) who works hard in dungeons for a few coins, there is a complete absence of any storyline. This is actually a big downer because unlike other games that just drop you into the action, there seems to be a lot of work done to make the game look good with a unique setting that invites for a richly filled story mode. As an homage to days gone by, the game has been created in pixel art, which immediately gives this old-school vibe that makes for a warm welcome and induces nostalgia. Because the game is in a 2D setting, it is ideal to make the pixilated graphics pop. A neat extra is that some elements of the game are fully 3D just like in Minecraft and this gives a good alteration between two and three dimensions. Animations are very fluent; from the boxes falling to chests opening, their locks swinging around due to the gravity, power ups used and the demon stones being spawned in a flashy yet intimidating way. The game has a medieval setting and its music perfectly accommodates this. The medieval music plays softly on the background, which makes the experience blend smoothly with the game. The sound effects are another strong point, just like the animations, everything is nicely accompanied by the right sound effects. Treasure Stack is an arcade title in which you stack chests on top of each other and open them with keys to keep your area from flooding. The core gameplay is simple and as the developers stated, the game is “easy to learn, difficult to master”. Initially the game feels impossible, as you will lose after a few minutes. However, slowly but surely, you will get better in placing and lining up the blocks and using power ups, but still it isn’t a game that you will become pro in overnight. The rules are very simple: line up treasure chests of the same color and unlock these with the matching key. 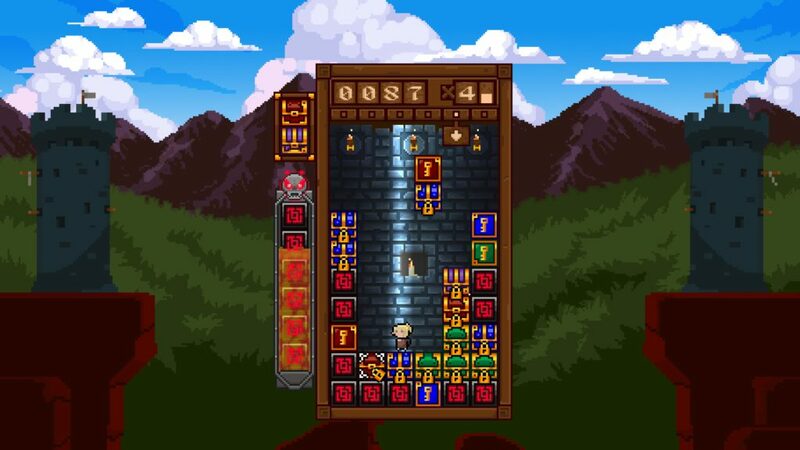 Just like in other puzzler games, this only works with chests that are placed in a four-way direction. If you need to clear some chests in a pinch, you have a few power-ups at your disposal. 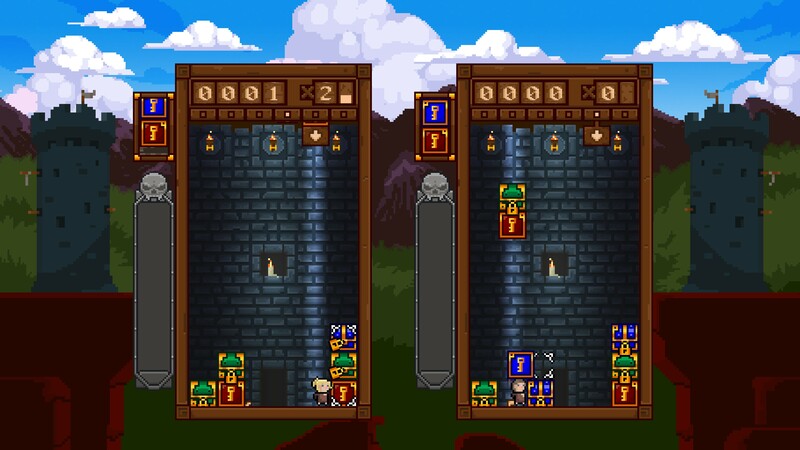 Bombs will clear a square of items, while a sword or anvil will clear a straight horizontal or vertical row. While there are helpful items that make your life easier there also are things that make it harder. In the solo mode you have a steady stream of demon runes and these will always place a row of irritating blocks that need to be destroyed by either items or by opening chests. This is all done by moving your character in the playing-field, don’t panic when you are stuck and there is a chest dropping on your head, you will just climb on top of said chest. With your trusty grappling hook you can pick up stacks flying right above you to place them down quicker. As the game picks up speed, you will notice that the controls aren’t that great all the time, especially when playing with a keyboard. If you plug in a controller, the game plays a bit better but there are still some quirks in the system. The biggest annoyance is that in the midst of the heat, the placing of blocks can be a bit iffy as the game places it one row further. This can be frustrating when you are just on a new row and miss a crucial combo due to this. 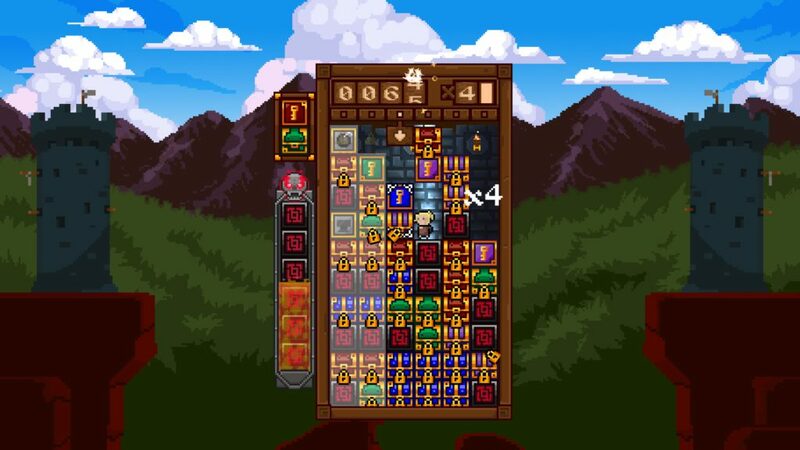 Treasure Stack is just like the developers say “easy to learn, difficult to master”. If this genre is something you can spend hours and hours on, it might be an interesting buy, but it does have a relatively high price tag. In all honesty, if the game would have been cheaper or would have more content, it would have gotten a higher score but it’s hard to defend the premium price, given the few simple modes.